Before you trade, how about getting your personal life in order? Trading, after all, is a mental game and the only way you can win a mental game is by keeping your mental poise so that you are able to make trading decisions with the right frame of mind. In a way, trading is a 24x7 game. Even when you are not trading in the markets, you are actually thinking about your trades, rewinding your good trades, regretting your bad trades and planning your next moves. Trading is not just about aggression but also about poise. Therefore, your state of mind makes a huge difference to your trading performance. It is very easy to say that one must create silos between their personal lives and professional activities, but that hardly works in practice. Your personal problems could come in a variety of ways. It could be a painful relationship that you are going through. It could also be your child’s future that you are worrying about. Alternatively, the health of one of your family members may be making it difficult for you to concentrate on your trading activities. Quite often, your own finances and rising debt could be a cause of concern. While all these are personal problems, they inevitably seep into your trading activities and affect your performance. Trading, after all, is a mental game and the only way you can win a mental game is by keeping your mental poise so that you are able to make trading decisions with the right frame of mind. Trading is best done when you can think clearly with a calm mind. Personal problems tend to get you embroiled in such way that you end up making trading decisions in the wrong frame of mind. That will soon show up in your trading performance. Trading is all about focus. Your primary focus should be to protect your capital and your secondary focus should be to identify opportunities. These things can only be done if you are in a positive state of mind. Personal problems tend to de-focus you. Trading is all about the victory of logical reasoning over emotions. Personal problems tend to make you more emotional and you may be inclined to take trading decisions more out of emotions rather than through logical evaluation of options. First, put your personal life in order, but how do you do it? • The first step is to recognize that you actually have a personal problem. The solution begins when you are honest with yourself. Quite often we tend to gloss over these personal problems in the fear that it may impact our trading performance. That is like making the same mistake twice. You are going to impact your personal life and your professional trading performance. Start by accepting that there is an issue. The more you just let your personal problems fester, the more it is likely to negatively impact your trading performance. • Most personal problems come with financial implications. Quite often, the problem may appear to be small once you make the financial provision for it. Whether you are worried about your impending divorce or your child’s future or your beloved’s health or your own finances, make financial provisions. In fact, paying off high cost debt can be a good way to avoid personal problems plaguing your trading performance. • There is nothing to worry about seeking professional help. A psychiatrist or a counsellor may help you see the problem in a new light. If that even helps you by a small margin, then why not. You don’t have to feel guilty about seeking professional help! • Lastly, a positive attitude can change a lot of things for you. Celebrate your small victories. Treat yourself and your family occasionally over small victories. It can be smart trade or a good week but you should feel good about it! The worst thing about personal problems is to lock yourself up emotionally. That will impact your trading performance. The bottom-line is having a calm and positive state of mind is the most essential thing. 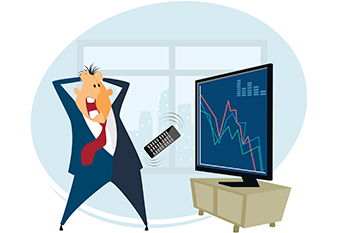 Don’t let your personal problems spoil your trading performance!